BIBLICAL ANTHROPOLOGY: What Does a Biblical Anthropologist Do? Biblical anthropology seeks to understand antecedents and explores the cultural context and beliefs of Abraham's cattle-herding Nilo-Saharan ancestors. Until we better understand their beliefs and religious practices we will continue to impose incorrect or inadequate interpretations on the Bible. David Noel Freedman has said: “The Hebrew Bible is the one artifact from antiquity that not only maintained its integrity but continues to have a vital, powerful effect thousands of years later.” Both anthropologists and archaeologists turn to the Bible for clues and data. Very often this has led to wonderful discoveries! A biblical anthropologist, like a biblical archaeologist, uses the Bible as a resource to gain a better understanding of the archaic world when "mighty men" established territories from Lake Chad to the Indus River Valley. They have been identified as the rulers of the widely dispersed R1b peoples. The highest concentration of R1b in Africa is in the Lake Chad region, Noah's homeland. There is nothing extraordinary about this venture, except that it requires reading the Bible differently than would a preacher or a theologian. This means that Bible commentaries written by Jews influenced more by the Babylonian Talmud are less helpful in establishing facts than the biblical texts themselves. Discrepancies between Talmudic interpretation and what the Bible reveals about Abraham's Ha'biru ancestors are significant and reveal that the core of Christianity is closer to the faith of Abraham than it is to the faith of modern Judaism. The Apostles criticised their Jewish brothers for departing from the faith of Father Abraham. Christianity is essentially about Jesus Messiah (Christ), and it is linked to the messianic expectation of Abraham's Proto-Saharan ancestors (c. 5000-3000 BC). People are astonished when faced with the anthropological evidence of Jesus as the fulfillment of a very ancient expectation concerning a Righteous Ruler who would overcome death and lead His people to immortality. They erroneously think of Jesus as the founder of Christianity, not the fulfillment of this ancient expectation. Analysis of the marriage and ascendancy pattern of Abraham's ruler-priest ancestors reveals that the ruler-priest lines intermarried and did not mix with people who were not Ha'biru (Hebrew). This is exactly the genetic outcome to be expected by the kinship pattern revealed in Genesis which shows that the ruler-priest lines intermarried exclusively (endogamy). To give an example of how differently a biblical anthropologist reads the Bible, consider the “begats” of Genesis 4 and 5. Most readers of the Bible skip over this list of first-born sons because they find the names difficult and the information boring. An anthropologist, on the other hand, will look here for clues as to the kinship pattern of these Afro-Asiatic rulers. This involves making diagrams which are used to analysis the pattern to draw conclusions. I execute the diagrams following E.L. Schusky’s Manual for Kinship Analysis. Besides kinship, a biblical anthropologist pays attention to details such as the location of sacred mountains and sacred trees, often identifying what the people would have regarded as sacred centers. We note that the oak of moreh, where Abraham pitched his tent, is called “the navel of the earth” in Judges 9:37. Moreh means oracle or prophet. The moreh's oak was halfway between the shrines of Bethel on the west and Ai on the east. Deborah is said to have ruled Israel from her palm tree half way between Bethel on the north and Ramah on the south. The oak was on an east-west axis whereas the palm was on an south-north axis, representing a gender reversal. Torah means 'that which is thrown by the hand' of the moreh or prophet. In Genesis 12:6, we read that upon his arrival in Canaan Abraham sought guidance from the oracle when he pitched his tent at the oak in Mamre. Torah, usually rendered guidance or instruction, was earlier associated with a prophet sitting under a tree. Moreh is the older word for prophet which was replaced by the word nabi. A biblical anthropologist seeks data as does every scientist. The data often suggests a hypothesis which requires investigation in other related disciplines, such as genetics, climate studies, migration studies and linguistics. The Afro-Asiatic languages share many common roots and these languages were spoken by Abraham's ancestors. The Afro-Asiatic languages include Akkadian, Amharic, ancient Egyptian, Arabic, Aramaic, Assyrian, Babylonian, Berber, Chadic, Kushitic, Ethiopic, Hahm, Hausa, Hebrew, Omotic, Phoenician, and Ugaritic. The language of Nimrod's territory was Akkadian. 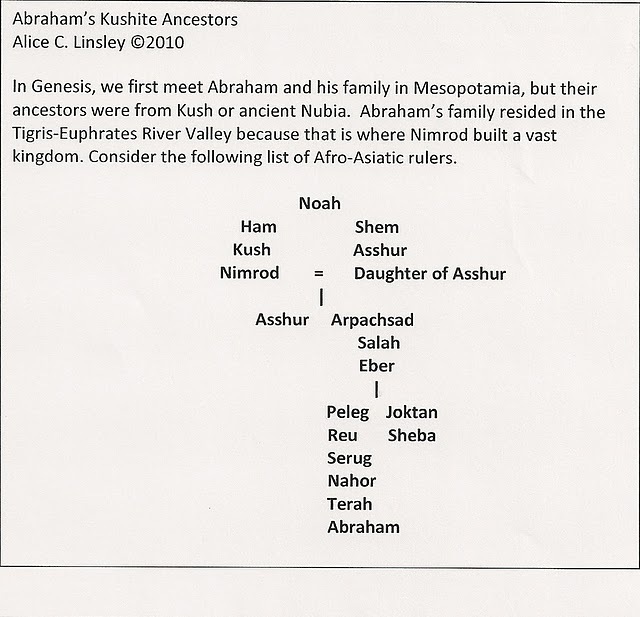 Genesis 10 designates Nimrod as a son of Kush. Nimrod established his kingdom in the Tigris-Euphrates River Valley and Abraham is descended from this great ruler. The languages of the Sudroid (the aboriginal populations who were displaced by Indo-Aryans) and Dravidoids of India is related to the languages spoken by Abraham's Ha'biru ancestors. The Indian archaeologist, B. B. Lal, contends that the Dravidians came from southern Egypt and Sudan (ancient Nubia). Lal writes: "At Timos the Indian team dug up several megalithic sites of ancient Nubians which bear an uncanny resemblance to the cemeteries of early Dravidians which are found all over Western India from Kathiawar to Cape Comorin. The intriguing similarity extends from the subterranean structure found near them. Even the earthenware ring-stands used by the Dravidians and Nubians to hold pots were identical." A biblical anthropologist will not be surprised to find that the word sakti which refers to wine in Tantric use at the harvest moon celebration in India, is the linguistic equivalent of the Falasha word sarki, which refers to the harvest moon festival in East Africa. Sarki also means ruler among the people of Kano (Nigeria). The Yoruba tell of a warrior named Bayajida who killed a snake called "Sarki" about 1,000 years ago. The root sar refers to rulers. Sar-gon means Most High King or King of Kings. Among the Igbo the Christ is called the "Great Serpent." Jesus self-identifies as such when He refers to His crucifixion as being lifted up, as Moses lifted the bronze serpent in the wilderness, and all who looked upon it were saved. 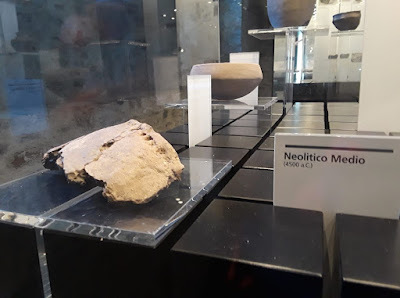 Biblical anthropologists make connections such as these. Sarki are also a priestly caste in the Orissa Province of India. They are the ones who sacrifice animals and tan the hides. God is the first sarki in Genesis 3:21 where he sacrifices animals to make coverings for the man and the woman. Sarki also live as ‘Haruwa’ in the Tarai region of Nepal. The word Haruwa is equivalent to the ancient Egyptian word harwa, meaning priest. Another word for priest is the Hebrew ‘Kohen’, equivalent to the Arabic ‘Khouri’ or ‘Kahin’ and the Persian ‘Kaahen’ or ‘Kaahenaat’ which is translated "timeless being". This word ‘Kahenat’ means priest in the Ethiopian Church. According to rabbinic tradition Moses had three brothers: Aaron, Hur and Korah. All three brothers were Horite priests. And Moses married a Kushite bride, not unusual for Egyptian rulers of that time. One of Abraham's most famous ancestors was Kush, the father or Ramaah and Nimrod. Maps are a valuable tool for biblical anthropologists and there are many available, though the quality is not always good. These must be studied to identify places associated with clans and rulers and to study their proximity to related peoples. 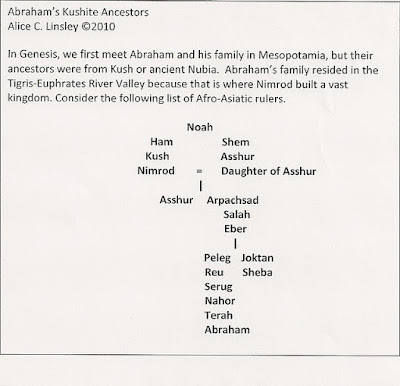 Significantly, the key names in Genesis do not turn up in Mesopotamia, but are found in Africa and in Canaan - Nok (Enoch), Kano (Kain), Ham, Bor'no (Land of Noah), Sheba, Terah, and the Yebu or Jebu (Jebusites). Elephantine, at the border between Egypt and Sudan, was known to the ancient Egyptians as Yebu, the linguistic equivalent of Jebu, and Jerusalem was a Jebusite city until the time of David. A biblical anthropologist finds anthropologically significant data in the Bible. With data such as I've presented, we can begin to construct a more accurate picture of Abraham and his Proto-Saharan ancestors who are listed in Genesis 4 and 5. We discover that there were priests O'piru, 'Apiru or Ha'biru (Hebrew) long before the time of Aaron. The Bible provides an enormous amount of information about these priests of the archaic world. The Ha'biru devotees of Horus represent a very ancient lineage of castes. They can be traced back to at least 5500 B.C. to Abraham's Nilo-Saharan ancestors who were cattle herders. 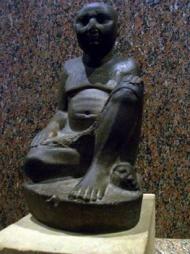 One of their shrines was a Nekhen on the Nile. The temple there is dedicated to Horus. Another Horite shrine was Heliopolis. The Harris papyrus speaks of 'apriu of Re at Heliopolis, the shrine of the Sun. Joseph married into this royal priest line when he married Asenath, the daughter of the priest of On. On is Heliopolis and it was one of the most prestigious shrine cities of the ancient world. Among Abraham's Nilo-Saharan ancestors, Hathor, the mother of Horus, conceived when she was "overshadowed" by the Sun, the emblem of Re. This is the origin of Messianic expectation. This very ancient narrative is the proto-Gospel, the telling forth of the appointment of the Virgin Mary who conceived by divine overshadowing, as the Angel Gabriel explained. Mary's father, Yoachim, was descended from the Ha'biru priests of old. Priests were circumcised and clean shaven. There was great emphasis on their ritual purity, especially in preparation for their term of service at the shrine or temple. The Ha'biru rulers had two wives, both half-sisters and patrilineal cousins. These were the daughters of priests, as the Ha'biru practiced endogamy. It is likely that Joseph's wife Asenath was a cousin, just as Zipporah was Moses's patrilineal cousin. Biblical anthropology has made great progress in identifying the marriage and ascendancy pattern of the Ha'biru. This brief overview should provide a general picture of what a biblical anthropologist does and I hope it will encourage some to consider working in this field. It is truly wide open and potentially very fruitful. This is a field in which to make your mark! At the rate in which archaeological discoveries are now being made in Africa, the material evidence for Abraham's Nilotic and Proto-Saharan ancestors is falling into place like pieces of a puzzle. I agree, but no publisher is willing to take a risk on material that, though fully substantiated by the data, is still controversial. Until one comes forward, I will continue to post the research at JUST GENESIS and BIBLICAL ANTHROPOLOGY. Thanks for reading, Martin. You will find all the information arranged alphabetically by topic in the INDEX at this site and also at JUST GENESIS.